P&O Cruises (Unnamed) 141,000 3,611 March 2015 The new P&O ship will be the line's largest ever by 22 percent. Get details on the announcement. Princess is more successful in this regard. If a ship or ships aren't filling, a reposition and itinerary change should be made. Granted, it takes a year or two to plan and implement this. Carnival Corporation & Plc just announced an additional $0.50/share dividend for shares on record as of December 7th for the quarter. That's on top of the $0.25/share dividend already announced. The cancellations have caused alot of upset but at least pax have a year to reorganise themselves, so its not so bad as a cruise that gets short notice cancellation as often happens. I still think P&o are going to have a difficult time filling this ship. Ventura & Azura are already too big for a lot of loyal P&O customers. I for one won't be even considering a cruise on any of these monsters. Love P&O and have to say that they aren't cancelling cruises at all....The cruise market is now slowing down some what as the recession is now taking effect. You have to remember that it took a while to take hold as people book so far in advance. Never known a cruise cancelled ever?? On my last cruise found a great gadget on there called mega-pegs.co.uk great for washing on the ships and sunbeds as well as loads of other stuff. Best thing I have found. just booked the Caribbean for Jan 2014 anyone else going? P & O Cruises Australia was also to get a new cruise ship in 2019, which was a sister ship to the new UK P & O Cruises ship, the aprox 142,000 grt ' Britannia ' ! Carnival group managment have now changed this order and instead will have the new ship join their own fleet operating in the USA and instead sent to Australia the 2008 built 113,323 grt Carnival Cruises ship ' Carnival Splendor ' which was the ship which broke down off the Mexican coast and with little power supplies on board, and having to be towed back to port, had to have food dropped to her by helicopter so passengers could at least get something cold to eat as the food on board would have been unfit to use due to loss of refridgeration ! With her air conditioning and toilets also not working correctly many passengers were sleeping on deck due to the heat and smell inside the ship and as a result she got called the ' Pong Ship ! With P & O Australia renaming old ships transfered to them from other companies as ' Pacific ------ ' , perhaps she should be renamed ' Pacific Pong ' ! lol. 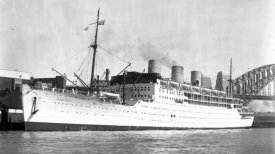 The last time P & O Australia had a new ship operate a cruise was in 1932 when the P & O ' RMS Strathaird ' made a cruise from Sydney to Norfolk Island at the end of her maiden voyage to Australia from the UK ! RCI Cruises, who now operate cruises from the Australian port of Sydney, often have some of their newest cruise ships making these cruises !